Following is the address of the Head of State, President Paul Biya to youths on the occasion of the National Youth Day 2018. Indeed, the characteristic "resilience" of the Cameroonian people deserves to be hailed once again, for, it must be stated, credit for the results we have achieved goes to the people. Not only did they not give up, but they lent their support to government’s action. Our compatriots at large, regardless of social status, remained united throughout the ordeals. And such is what makes a great nation. Allow me, once again, to underscore the heroism of our defence and security forces - mostly young people - whose sense of duty and responsibility has been beyond all praise. Accordingly, we should commend the holding of events such as the recent African Union / European Union Summit in Abidjan, which focused on youth education and training in Africa and particularly the acquisition of new technologies and modernization of agriculture. These orientations are in line with the objectives of China’s "new silk road" initiative and the development assistance projects of Asian countries such as India, Japan and South Korea. So, there are reasons to not yield to pessimism. I believe I can safely say that the State has done much in recent years to prepare you for this lofty task. Regarding the budget, the combined allocations of the three ministries responsible for education represent about 15% of public spending. Great strides have been or are being made in terms of infrastructure, school facilities and educational opportunities. The government’s policy, geared towards learning trades as well as vocational and technical training, is beginning to pay off as it fosters self employment and the socio-economic integration of youths. Our GESP-based development programme will be continued, as will the three-year "special youth" plan which, since its inception last year, has prioritized youth access to agriculture, industry, handicrafts, the digital economy and innovation. Nearly 500,000 youths have already registered with the National Youth Observatory to participate in the aforementioned youth plan. As funding has already been secured, its implementation will be accelerated in 2018. The year 2018 will also be a decisive one for the preparation of AFCON 2019. The State has pumped considerable resources into it. It will then be up to our footballers to live up to their reputation and the outstanding achievements of their illustrious predecessors. They have demonstrated in the past that they are up to the task. From my position as Head of State, I perceive signs of your growing interest in public affairs. In this regard, your favourite platform of expression is the social media. Whenever at a click, you access these communication highways that give you global visibility, you must bear in mind that you are not exempted from fulfilling civic and moral obligations, such as respect for others and your country’s institutions. 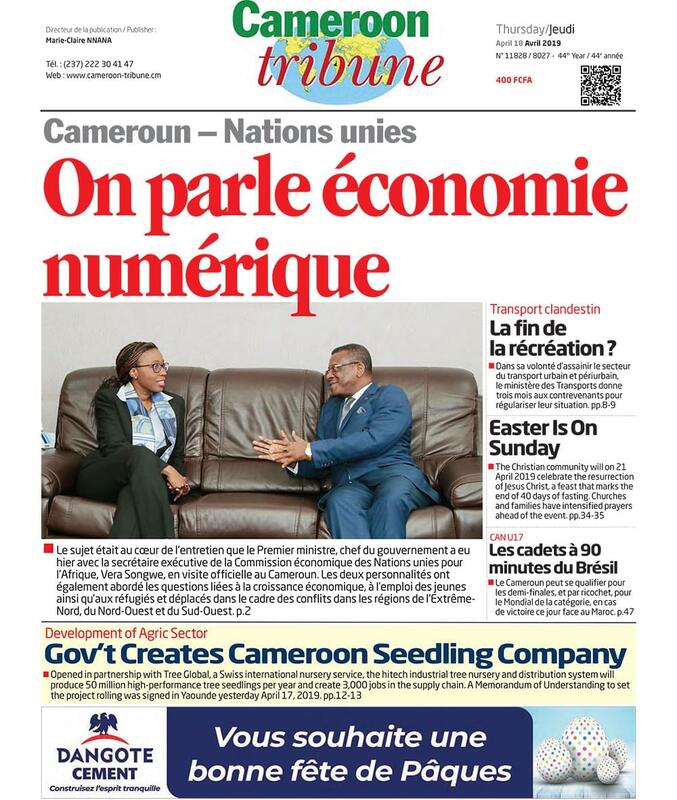 Be patriotic Internet users working for Cameroon’s development and influence, and not passive followers or naive relays for staunch critics of the Republic. The Cameroon of tomorrow, which is being forged before our very own eyes, will differ almost entirely from that of yesteryear. You will be its key beneficiaries. You will need to prove yourselves worthy of it. The world is about to witness a dramatic change. The populations of most developed countries are aging. Africa, on the contrary, will be a continent of predominantly young people by the middle of the century. This constitutes both an opportunity and a challenge. Let us seize the opportunity and meet the challenge. I believe our youths are capable of doing so. A final word. As you know, 2018 will be an important election year. You all who will be aged 20 years and above will be able to - or rather should - exercise your right to vote. By voting, you will be performing an act of responsible citizenship and, thus, participating in forging your destiny.